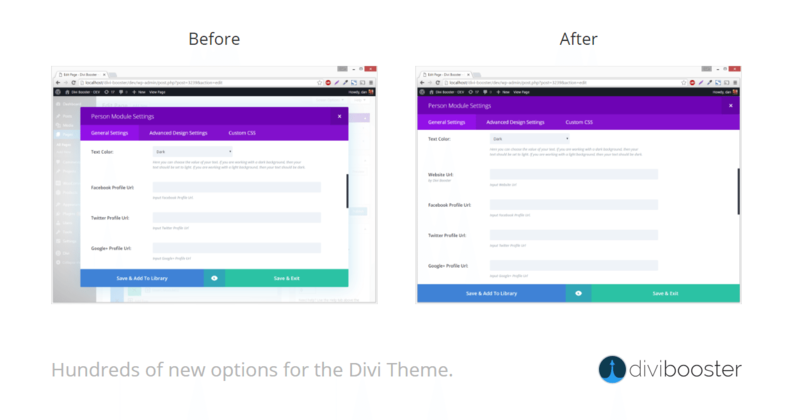 We have a little surprise for the Divi community! We’d like to present you with The Ultimate Divi Bundle. What’s inside this special Divi Box, you ask? Well, we at Aspen Grove Studios have teamed up with some of the greatest Divi Developers to bring you an incredible collection of Divi-specific plugins to use during your website builds. 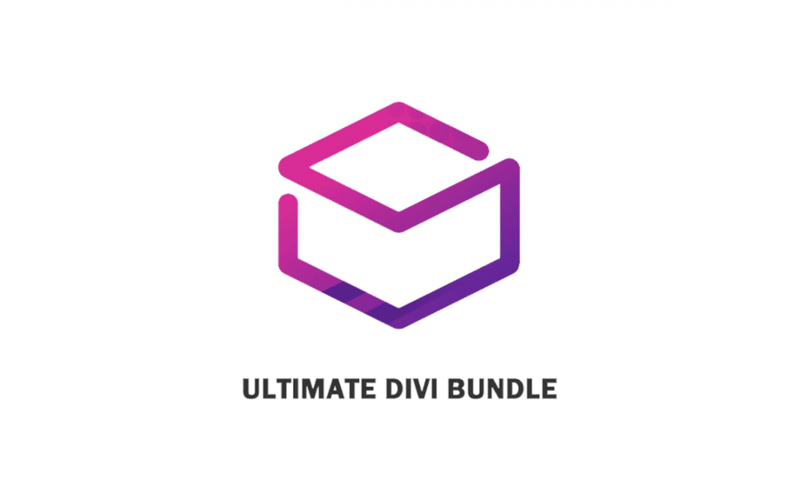 Packaged as one file, we’re thrilled to bring you the Ultimate Divi Bundle! What’s included in the Divi Box? WHY YOU SHOULD PURCHASE THE ULTIMATE DIVI PLUGIN BUNDLE? 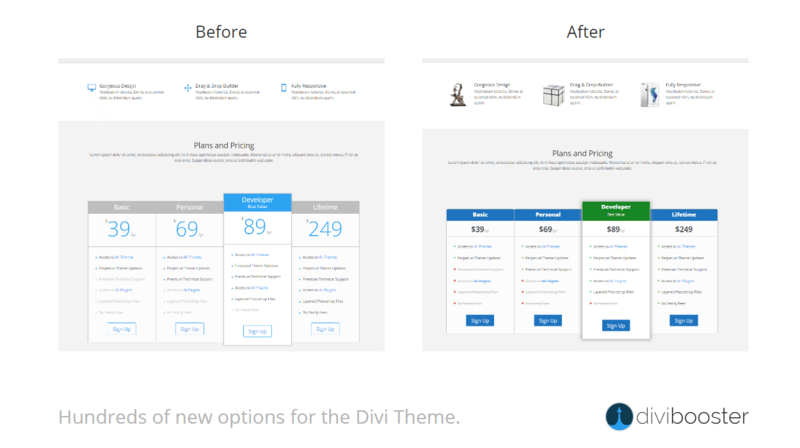 Divi by Elegant Themes is truly an incredible WordPress theme (actually, it’s the greatest WordPress theme, in our honest opinion), and thanks to the modular Divi Builder, with its drag and drop interface, building a website with Divi is incredibly easy and requires no previous knowledge of code. 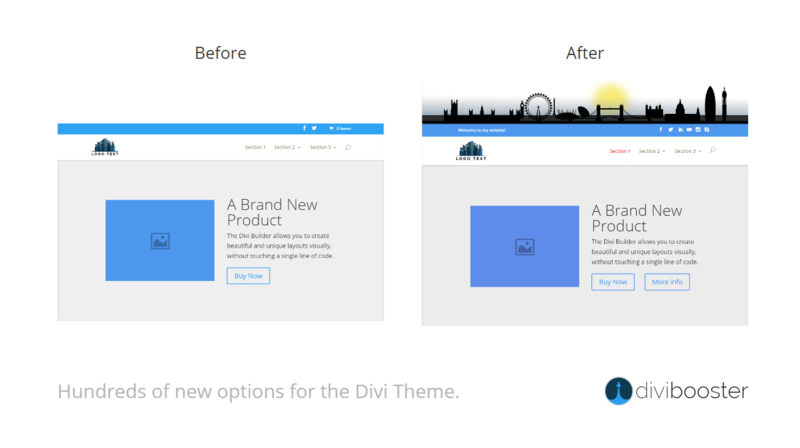 Despite the fact that the Divi theme and Builder are really easy to navigate and that the Divi modules are incredibly simple to customise, there are often times when a few handy tricks could really help in setting your website apart, and a little bit of extra attention and manipulation is needed to get certain aesthetics and functionalities looking and working just right. Maybe you’ve battled to change the height of a slider module? 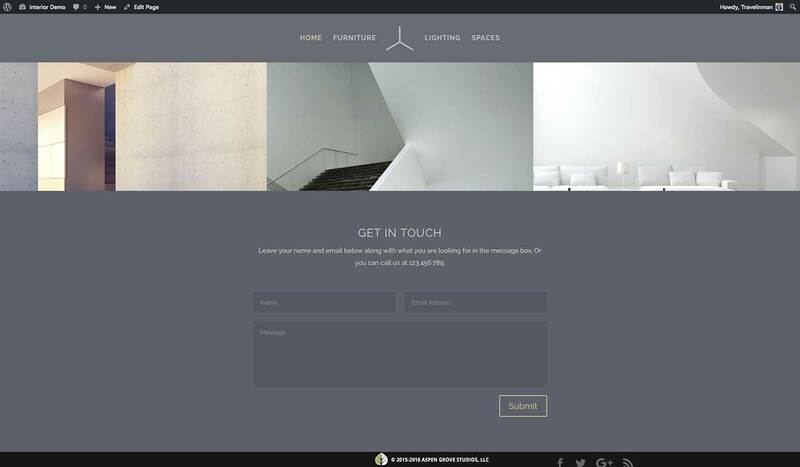 Or maybe you’ve searched high and low throughout the theme for an easy-enter area to change the default Elegant Themes footer? If you’re a code savvy dev genius with a strong grasp of CSS and PHP functions, finding your way through Divi’s gray areas is hardly a challenge, but if you lack these specific skills you could find yourself at a slight disadvantage. For most of us – who are still on Level 1 in wizard school and are quite a while away from reaching Gandalf XP status – we need a little bit of extra help now and then, and thankfully, it’s pretty readily available. Luckily for the Divi community, there are a group of incredibly talented independent developers and development agencies that have been producing Divi-specific plugins to solve just about any and every Divi-related area of sensitivity. Where previously, figuring out a Divi theme query could have resulted in hours of research and risky trial and error (an actual nightmare for those who might not be 100% confident in understating the ins and outs of running a child theme or editing the .php code in the theme’s Editor console), now there exists a collection of really powerful products that completely resolve the finer Divi development details – letting you supercharge your Divi website without touching a single line of code. Each of the plugins included in the Ultimate Divi Bundle are incredible assets to have in your web dev toolkit, and having, and using, them collectively will bring an even more powerful combination of web dev mastery to your Divi site build. Get The Ultimate Divi Bundle! 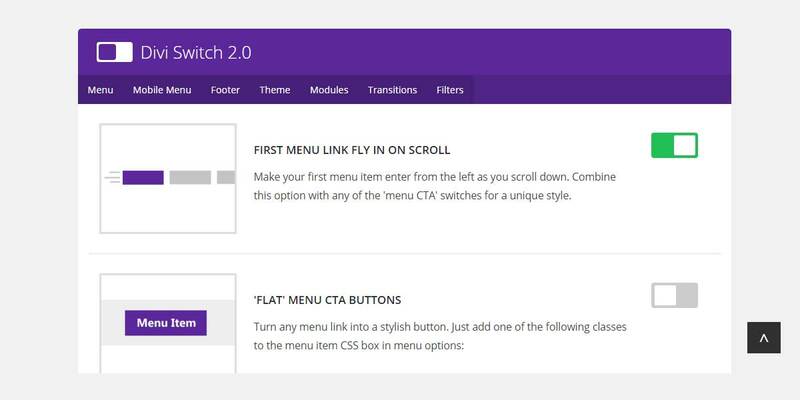 Created by SJ James of Divi Space and Gritty Social, Divi Switch – the second plugin ever developed specifically for Divi – is an incredibly powerful tool that allows you to make really nifty changes to your Divi website at the flick of a switch. 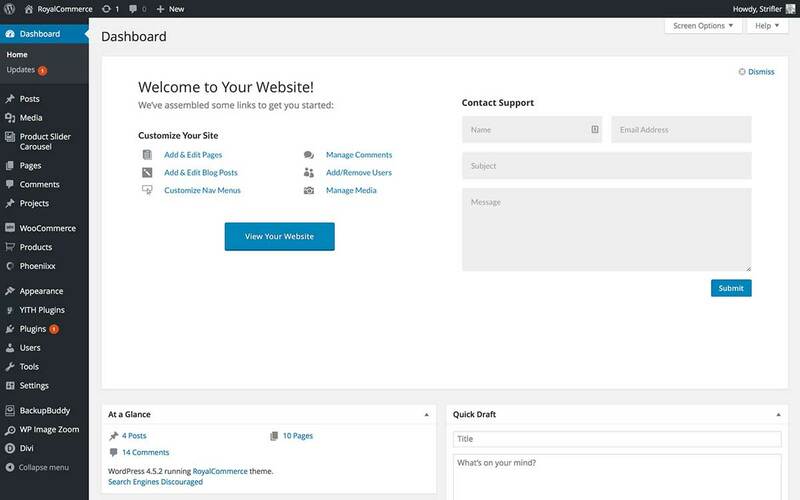 After install and activation, Divi Switch will appear directly on your WordPress Dashboard for easy access. Here, with over fifty toggles or ‘switches’ that are easily turned on and off, you’re able to make hundreds of customizations to your website, practically instantaneously. Listed beside each of the switches is a short description or explanation of the switch itself and its function. Some switches are a bit more complex and require a little bit of work from the user to set up and manipulate CSS classes. For these few switches, additional detailed information is offered in the description. Just scratching the surface, some of the amazing features of Divi Switch include allowing you to instantly add a nifty page pre-loader, explore more animation and transitions options, add Divi styles to Contact Form 7 forms and change image aspect ratios. 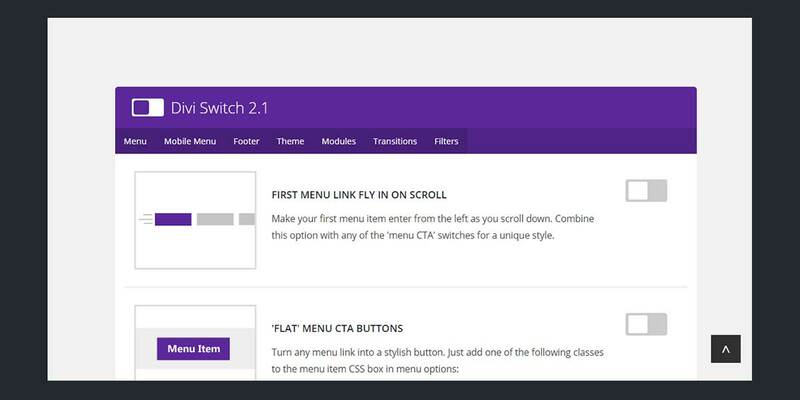 The list of switch options runs really, really long, so be sure to read the Divi Switch knowledge base article for a full breakdown of all of Divi Switch’s capabilities. One of the most common Divi and Extra related gripes revolves around the inability to easily edit the footer. Where the Divi Builder can build just about anything, the same swift functionality is omitted from the footer, and removing and replacing the default Elegant Themes text can prove to be a challenge for those who aren’t familiar with child themes and the intricate workings of .php files. Here, the Aspen Grove Studios Aspen Footer Editor – the third ever plugin made specifically for Divi – comes to the rescue. 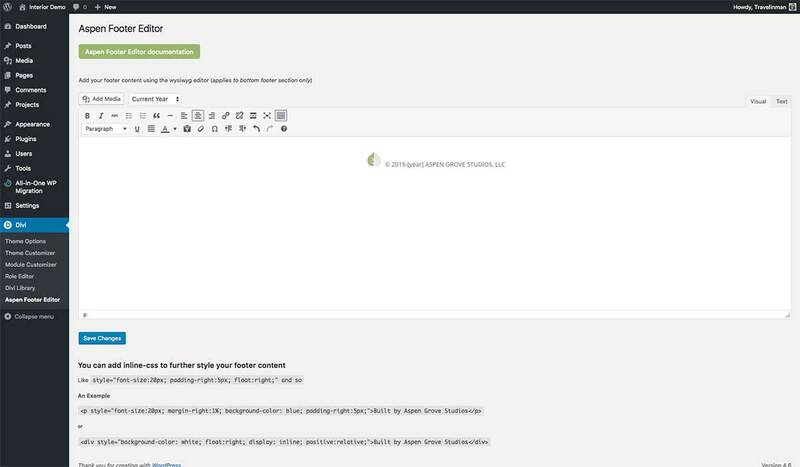 Through the Aspen Footer Editor, you’re able to create and style out a site-wide footer that includes your own custom text and credentials. With a WYSIWYG interface (that mimics the default WordPress post or page editor), setting up your new footer area is really simple, and as well as entering custom text and hyperlinks, you’re also able to add graphics (logos) and video assets for an extra visual punch. 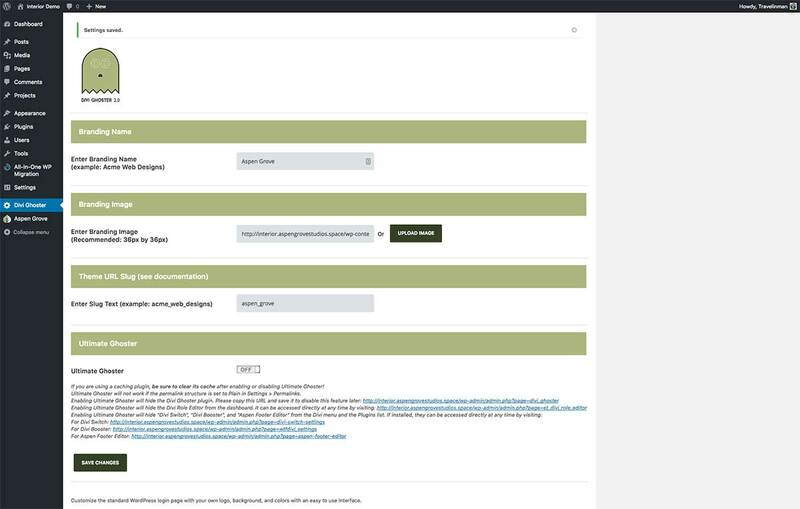 Another great feature of the Aspen Footer Editor is that it comes hard coded with the functionality for dynamic dating. This means that as each year passes by, the date stamp of your footer will automatically update to the correct year. If you’d like to test drive the Aspen Footer Editor in action, check out the live demo (use ‘demo’ as the password). 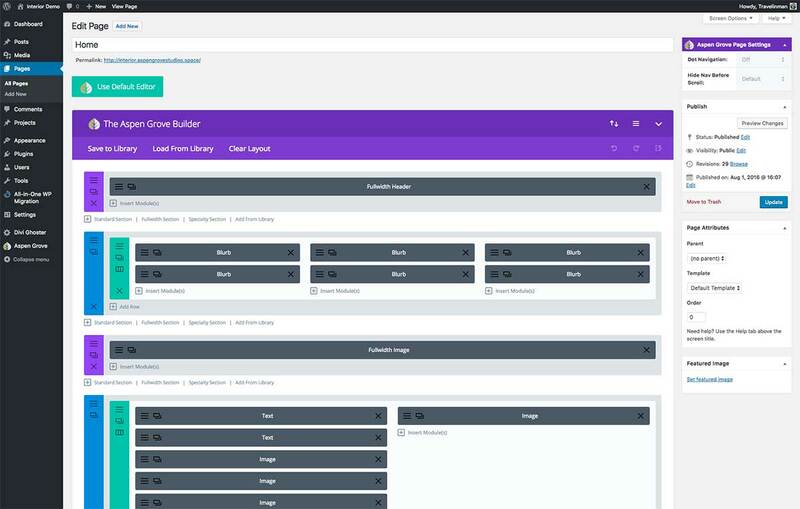 Developed by Tim Strifler of Divi Life, Divi Dashboard Welcome gives you the ability you re-engineer the default WordPress Dashboard console to fit either your own design style or your client’s custom branding. 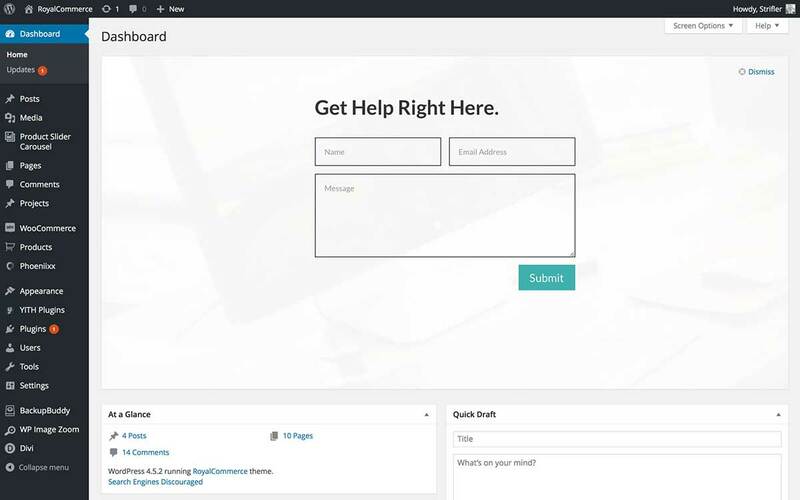 With Divi Dashboard Welcome, you’re able to use any of the modules available through the Divi Builder and customize them, in the normal Divi way, to your hearts content. The sky really is the limit here, and you can go totally crazy with however you’d like to design either your own or your clients’ Dashboard. 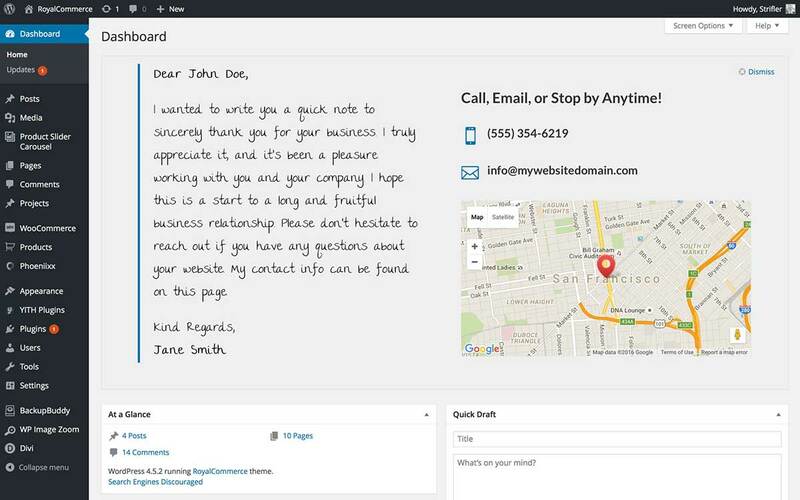 Maybe you’d like to leave little notes to your clients that will help them with managing their website, or, maybe you’d like to streamline their workflow, for example, by offering quick links to their crucial tasks (such as content posting and comment moderation) and removing the superfluous extras. 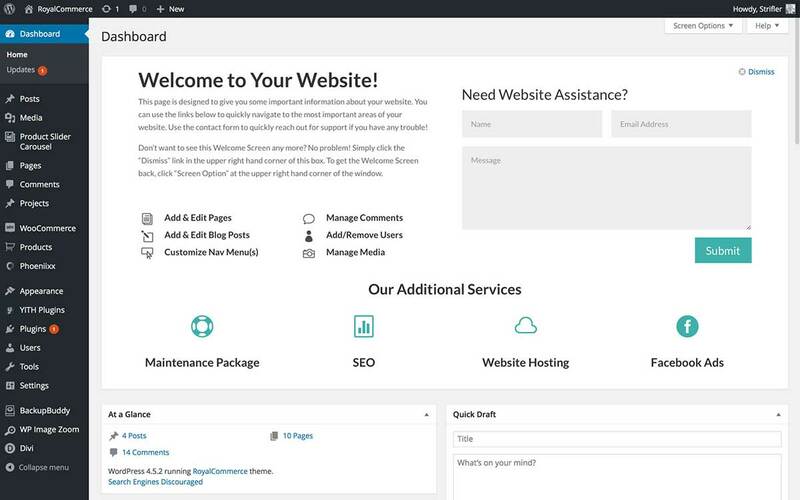 Nevertheless, personalizing the WordPress Dashboard adds a truly special touch to a web asset, and if you customize the Dashboard to include your contact details as a subtle soft-sell for yourself, your clients will always know how to reach and refer your web design services. 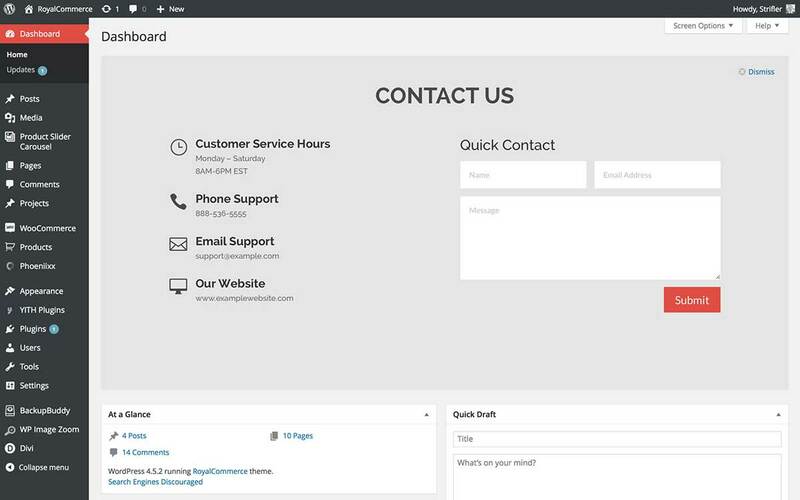 Divi Dashboard Welcome comes complete with five pre-styled Dashboard layouts that you could simply insert and edit, or you could easily create your own through the Divi Builder. The latest version of Divi Ghoster by Aspen Grove Studios gives you even more power over your WordPress website by disguising your use of Divi in development than before. The recently released 2.0 update sees the original white label Divi plugin include even more amazing features, now not only allowing you to hide multiple instances of Divi across the back end of your WordPress website but also hiding your use of Divi and Extra from source code and theme detectors. As well as replacing the visible Divi branded aspects of the backend (dashboard, theme, page builder, and page settings) with your own custom text and logo branding, the Divi Ghoster lets you quickly edit the slug text within the side-wide URLs from displaying as ‘Divi’ to custom text of your own. 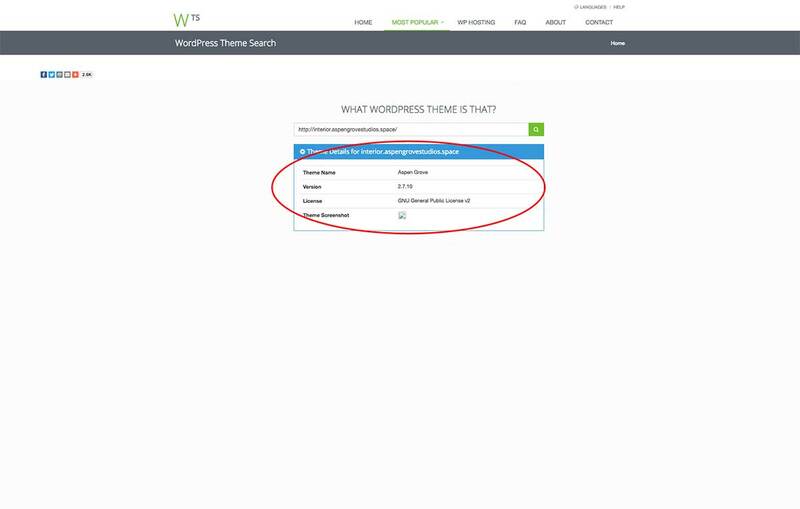 The Divi Ghoster also includes a Login Customizer which lets you edit the default WordPress admin login page to fit either your own or your client’s branding. In the 2.0 update, the Ultimate Ghoster levels up. 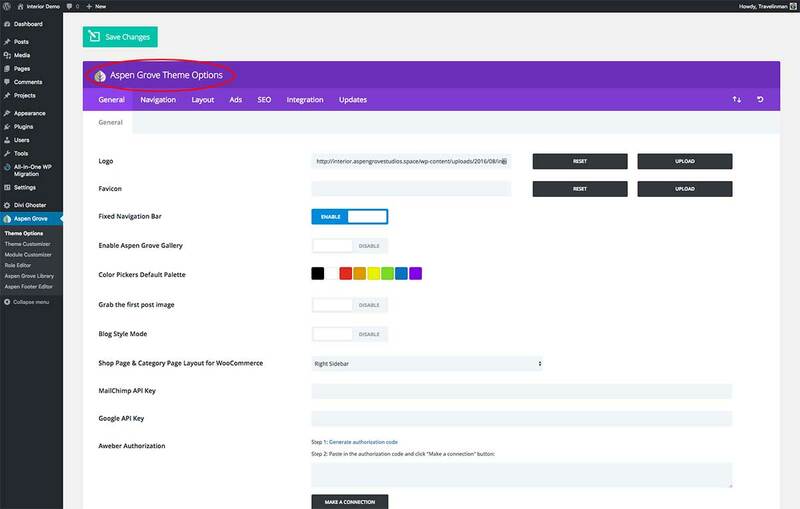 As well as the original 1.0 plugin functions (which allows you to remove the theme selector under the Appearance Tab, the Divi Role Editor and the Divi Ghoster plugin itself from your WordPress dashboard), you’re now able to completely mask your use of Divi and Extra in development from source code (Google Developer Tools) and most theme detectors. The first ever plugin created exclusively for Divi, Divi Booster by Dan Mossop brings you over 50 customization options to give your Divi website a boost. 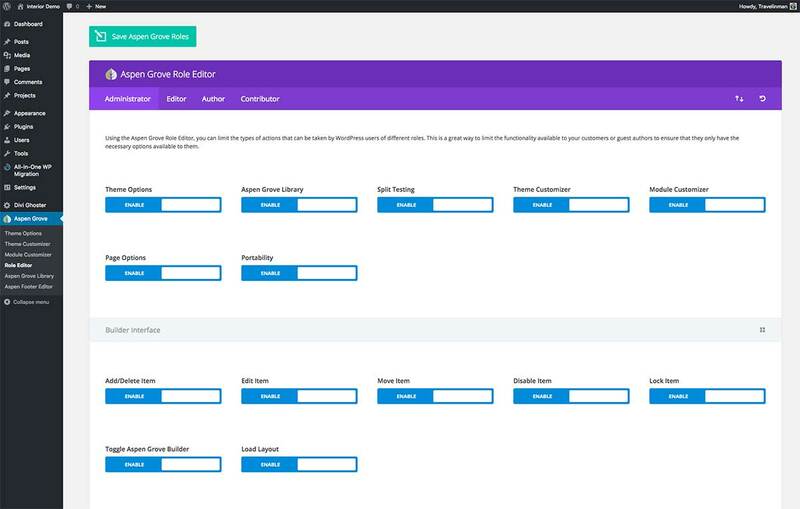 With Divi Booster, you’re able to bypass a series of laborious and complicated code-heavy processes and simply enjoy the ease of making rapid changes to your website by simply selecting a setting. With a really easy-to-use check-box interface, Divi Booster’s customization options are either enabled or disabled through a series of check boxes. Without having to touch a line of code, Divi Booster allows you to make powerful changes to your Divi website, and too, allows you to customize either single page aspect settings or the alter the default Divi modules so that the changes occur site-wide. This is an incredible time and research saver. 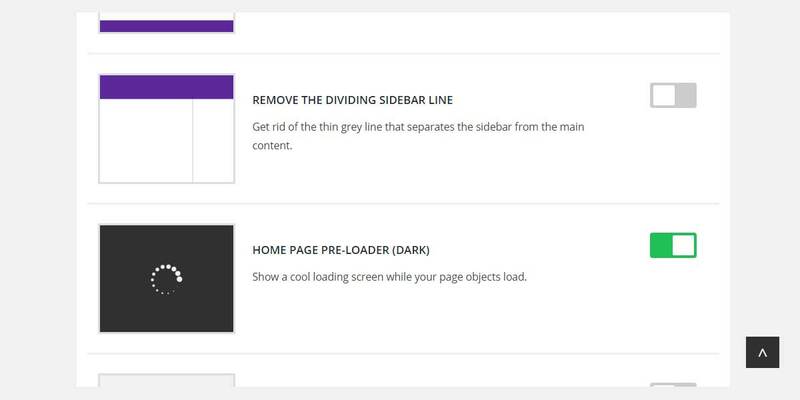 As well as being able to edit footer information, change the look of a sidebar and alter the aspect ratio of images, and plenty of other tricks, Divi Booster really is an incredible plugin to have in your web development toolkit. Read through the full list of the Divi Booster features here. Please feel free to leave any comments or queries that you might have below, we’d love to hear about your experiences in using any (or all) of the above-mentioned plugins in the Ultimate Divi Bundle! Hello, there! I just purchased Divi Ghoster 2.0 and Aspen Footer Editor last week. Are there any options so that I don’t have to pay for them again to get the other 3? Thank you and love your stuff! Please head over to our support forum and open a ticket (category: Ultimate Divi Bundle), we will be very happy to address your request. Damnation, what if we already have 3 of the 5?? say I buy this, should i use it in only one website or numerous websites are allowed?? how about updates, is it free? You may use it on as many websites as you wish and updates are included.. forever.